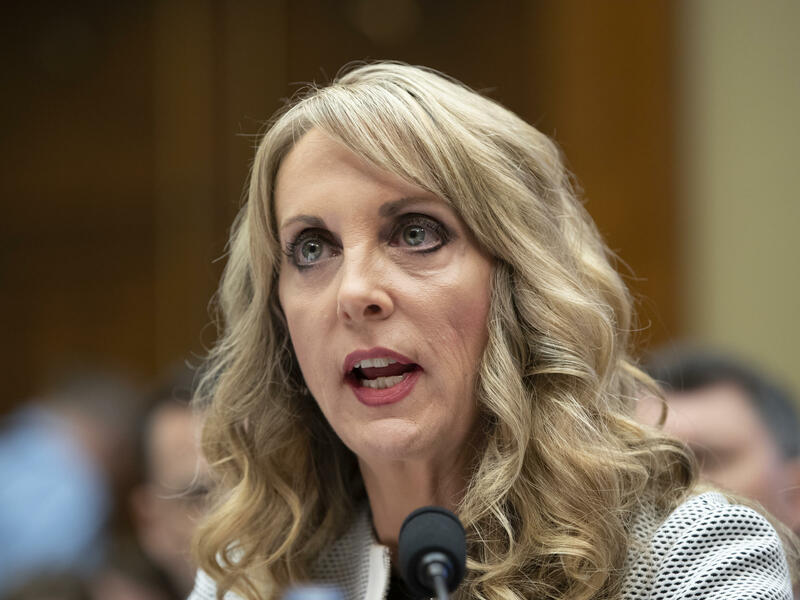 Kerry Perry, shown here testifying to lawmakers in May, has resigned from her post as USA Gymnastics President and CEO. Fewer than 10 months after taking the job of USA Gymnastics president and CEO, Kerry Perry has resigned. Perry has been under scrutiny from the U.S. Olympic Committee as USA Gymnastics attempts to navigate a path forward following a sexual abuse scandal by former team doctor Larry Nassar that involved hundreds of women and girls. Nassar has been sentenced to decades in prison. According to a statement Tuesday by the USA Gymnastics board of directors, Perry's resignation is effective immediately. "In the wake of horrific events that have impacted our athletes and the entire gymnastics community, USA Gymnastics has made progress in stabilizing itself and setting a new path to ensure that the safety and interests of our athletes remains at the heart of our mission," said Karen Golz, chair of the USA Gymnastics' board. The search committee for the next president "has been charged with finding a leader who can help the organization build on the progress to date and achieve the fundamental cultural changes necessary to move the sport forward," the board statement read. Last week, the new U.S. Olympic Committee CEO Sarah Hirshland told USA Today that USA Gymnastics "is struggling to manage its obligations effectively and it is time to consider making adjustments in the leadership." Hirshland's comments come amid fresh scandal for USA Gymnastics. Last month, it promoted coach Mary Lee Tracy, who had defended Larry Nasser as the abuse scandal initially came to light, to elite development coordinator. Several days later, after top athletes such as Aly Raisman protested, USA Gymnastics asked Tracy to resign. "The PR nightmare [over Tracy's promotion] was just the latest for USA Gymnastics under Perry, whose inconsistency in personnel decisions, inability to articulate a clear vision for the future and low public profile caused chaos for an organization looking for bold leadership." In May, Perry testified before a House subcommittee about the organization's handling of the systemic and widespread abuse by Nassar. "Like all of you, I was appalled and sickened by the despicable crimes of Larry Nassar," she said, as NPR's Laurel Wamsley reported. "We must do better." When asked last month whether USA Gymnastics was improving, Olympic gold medalist Simone Biles responded tepidly. "Hopefully it's going in the right direction, but nobody can know until Kerry Perry speaks up. So it's kind of hard," Biles said, according to the Star.